Hosting a fun boy themed baby shower doesn’t get much easier than with these cute boy baby shower game ideas. We made sure that they are super easy to prepare but engaging for players and especially keeping with a boy themed celebration with some emphasis on blue. There are tonnes of theme ideas for a boy shower including but not limited to sports the color blue and even daddy's profession or passion. A good boy themed game is blue tray game. 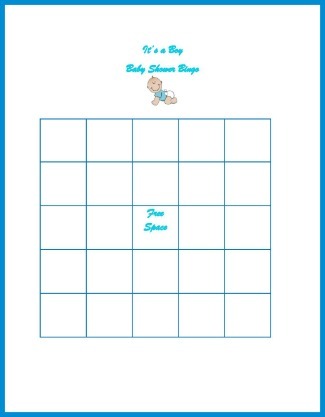 This is a boy baby shower game that puts emphasis on blue. Preparation for the game entails assembling about 8 to 12 baby items that are in blue such as blue socks, blanket, rag, bottle, rattle, pacifier, a toy and so on. Place them on a regular serving tray on the day of the shower. Place the tray with the items on a table where it can be viewed by everyone. This way it can be easily mistaken for table decoration. Cover or remove the tray before handing out paper and pen to each person and ask them to list as many items as they can remember that were on the tray. The person with the most correct answers wins a prize. Have some fun trying to make as much baby boy names from the phrase below. Guests should be given 5 to 10 minutes to write their answers. When you call time each guest gets to read their names aloud quickly with each person ticking off any name they have on their list with the person with the most original names winning a prize. "The Mommy-To-Be is Having A Gorgeous Baby Boy"
Another way to play is by using the mom to be full name and see how many names guests can find from it. Get this game now by clicking the link, print and play. We love Bingo and your guests will too. Simply print a free version of this game for each player and hand them out with a pencil. Ask everyone to fill in baby boy related items in each square and then from a list that you prepared or from the one below call out each item. The person or persons that get five in a row shouts bingo and they win a little game prize you have ready. Everyone loves a good race. So let everyone give mommy-to-be some baby name ideas while racing to get names for each letter. 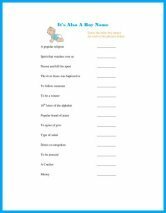 A to Z race is a fun, fast-pace boy baby shower game that is a creative way of getting friends and family to give you their ideas for names.